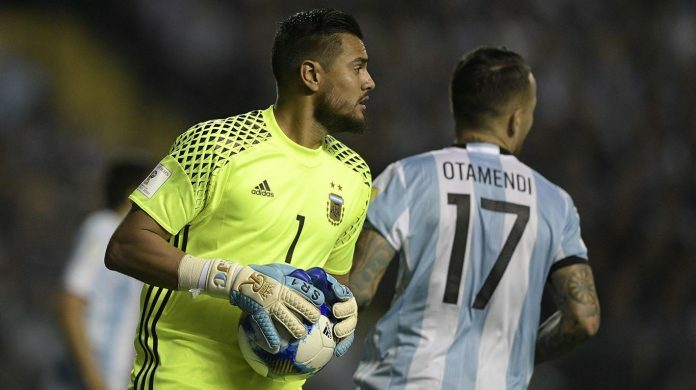 Manchester United and Argentina goalkeeper has his eyes set on the next year’s Copa America and the 2022 World Cup in Qatar. A team mate of Lionel MESSI’s since the 2008 Olympic games, ROMERO said he expects MESSI to come back to the team. 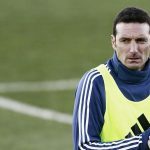 ROMERO also gave his thoughts on current Argentina coach Lionel SCALONI. Just Imagine Messi and co winning the next two Copas 2019 , 2020 and the world cup 2022!! What a marvelous way to end a career!! With Messi, Aguero, Dybala actually playing together for the first time, nothing is impossible! Their counters would be beauty in the making! I don’t see anything wrong in Romero’s remark. Every one dreams to play the maximum possible WC for his country. Romero is no exception. Whether he will be fit or not , whether he will still be able to maintain his form or not is another question all together. I personally don’t see Romero beyond Copa 2020 (Max). So too with Aguero, Banega, Otamendi , Dimaria( if not 2019 Copa), by that time the transition should be completed. Messi is a different proposition all together , but I doubt he will continue with national service if we fail to win any one of the Copa’s happening in the next two years with him. The team is on a rebuilding mode and it will take time to get the free flowing football in place as we are used to see with Argentina. 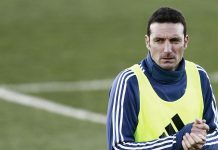 If Scaloni is trusted with the job to continue, which seems almost foreseeable as all the players are gradually voicing their support for him and AFA has no appropriate options to replace, then he should start drafting the first XI for copa and best possible 23 with immediate basis. The March Friendlies should be played with the first choice XI and whatever match we get before copa in June should be used for fine tuning if any. Experiments are done, new faces introduced, it’s time to get on the next set of steps. I personally Like the trio of Scaloni-Aimar-Samuel as they can be of immense help to our young guys sharing their experience of the big stage. But the final third passing still needs attention and work. I know this would happen like this only. Had he started the World cup he would have satisfied,(Ahem Anyway we would have still crashed out, We were total chaos, All the bad things happened during 2018 WC, In fact the worst. ), Now look whats coming…Romero our Number 1 GK 2022. Perfecttttt..Why 2022?? Goal Keepers age like fine Wine, 2026 also can be worth a shoat. After all he is the Best Goal Keeper we have…Ever. Nothing wrong with Romero‘s ambition because every player should want to be there if not something is wrong with that player. Doesnt mean he will play though. If he ends up being starter in Qatar than something went wrong and we lack quality. Teams who lack quality dont deserve to win the World cup. All players dream of taking part in a WC regardless of their age and I don’t mind if he goes to Qatar but the 1st and 2nd spot must be given to younger goalies like Andrada or Gazzaniga for instance. Romero isn’t as good as he was 4 or 5 years back but his inclusion in the team can benefit the other goalies. I think he himself knows that the first spot isn’t his anymore. The first ever world cup that I ever saw was the 1986 world cup, and I was three years old and from that World cup to the last one in Russia 2018, the one glaring difference in Argentine national football I have seen over the years is the complete absence of a good defence and midfield line. The same was the case with 2010 World Cup when Maradona murdered Argentinian defence and midfield. Argentina should again be fortify the defence that never let goals in, for that we need a great goalkeeper. Do we have one truly outstanding goalkeeper now? No. We need the best defence line. Do we have one truly outstanding player? No. We need the best midfield line. Do we have one truly remarkable midfielder now? No (except Lo Celso). We have some of the greatest midfield talents playing in the whole world for eg. Ever Banega and Manuel Lanzini (When he is fit). I hope Ezequiel Barco soon prove his worth in a European team because he looks promising. 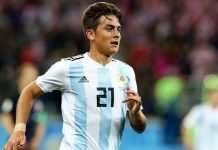 Is there anyone better than Banega, Lo Celso and Lanzini now in Argentina football? No. Do we have the a truly amazing forward line? No. 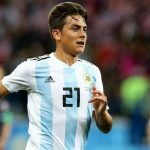 Dybala is ‘just’ okay, same is the case with Martinez, Vazquez, Icardi, Simeone, Correa and Pereira. Do they need more time to prove? No. Talent doesn’t need time. How did Messi prove his talent when he was hardly 19 years old in Argentina team? How did Diego Maradona proved his worth as a teen? They just played truly beautiful football, that is all. You don’t need time to ‘fit in’ or ‘prove’. Same way, Lo Celso proves his talent in every single game he plays. It is sad, but yes that still the 31 year old Messi, Di Maria and 30 year old Sergio Aguero play levels above the ones from the current crop. And yes, we will need Banega, Lanzini, Messi, Aguero and Di Maria back in team. And yes, a footnote, for me, the greatest Argentina team played between 2007-2009, and the team that played Copa America 2007 was unbelievable and the best footballers Argentina ever made played in the past 15 years and never won a Cup, heartbreaking. Completely heartbreaking, but it has some truth to it. I disagree with you on one thing, Don’t compare any player’s talent to Messi or Maradona, Those are exceptional. WE certainly have the talent, but WE lack the time and patience, and above all moral support and respect for the players. WE don’t need 10 Messi(s) or 10 Maradona(s), WE need good management and patience. What else we need is rationality that some players can not be excluded because they are described as ‘failures’. WE need cohesion that comes with time. That time can be short( keep the core of the team and add to it), or Looooong ( start completely from scratch). Many do not want the best to be part of the NT just because they had their chances and they will sacrifice the coming COPA19 and COPA20 and confederation Cup tournaments for what they think is a guaranteed trophy in 2022 or 2026 if WE drop all who can still add to the NT. Let alone guarantee qualification for said WC(s). Throwing a whole generation of players and starting from scratch, breaks the cycle of transition, When there is no transition, there is a brand new beginning, means starting from the scratch and not handing the experience of one generation to the next. So talent alone will not win you trophies, Experience and moral state plays a huge part in becoming champions. to make our journey short lived and preserve cohesion and chemistry of the squad, WE should have kept the cohesion intact and introduced younger fresh blood gradually. With no moral and fan support, but demeaning and humiliating. how do you expect such players to keep giving? How players will play when they are called : La puta que los pario on their national TV? and many degrading phrases? To me, the worst that happened to Argentine National Team was Maradona as Coach, kicking Riquelme out and taking the Captain’s armband of Zanetti and giving it to Mascherano when Veron, Cambiasso Riquelme, Zanetti, Walter Samuel, Heinze and Milito were playing in the team. How is it normal? Maradona is a legendary player, and absolute great but to me his time as coach killed the team. He threw Cambiasso, Riquelme and Zanetti out. And it is so sad that Zanetti and Cambiasso were the midfield line that won the Champions league for Inter the very same year. And look what happened to Argentine defence in the 2010 World Cup, an utter disaster. If Argentina has to come back to its previous glory, they should bring back and integrate the experienced players like Banega, Di Maria, Aguero, Messi, Battaglia, Pizzaro, Pastore and Papu Gomez with young players. You need to ‘pass the baton’ properly from one generation to the other. You can’t throw away an entire generation of players who still play better than the ‘future’. And to ‘win’, and a team need to fortify ‘defence’ so what happened with France and Croatia in 2018 World Cup or with Germany in 2010 World Cup doesn’t happen again. You can’t do anything without a solid defence and midfield, even if Maradona and Messi play together for Argentina. couldn’t agree more! well put. His set pecies are unbelievable good. He can control the rythem of the game. in January he will be Playing ac Milan . you don’t understand, these guys play in completely different leagues AND NEED TIME. Talent does need time and that is one thing you don’t get. When you said Messi was super good when he was 19, not true, he had POTENTIAL, not talent. Talent took around 1-2 more seasons to really become the player he is, also he was 19!!!! HE WAS A SPONGE, he learned so much better. These guys are a little bit older and accustomed to different types of football. Messi just fit in, that won’t be the case for these guys, not yet at least. Give them time or you shouldn’t be here, you are just another bandwagon fan, so leave. Yeah Romero , bring Masche with you…. If Biglia comes out of retirement…..
Don’t even want to think about that! my comment was meant to be .. a joke! Come to scene… so quick. It seems that Scaloni has the support of the key players, first Dybala now Romero . which is a healthy sign. At least the man is honest about his feelings and not dancing around the subject like many other players in his shoes would do. He remains to be #1 in my book until another proves otherwise and NO it is NOT Rulli….not by a long shot.